Snowpack tests are commonly misapplied to the process of decison-making. 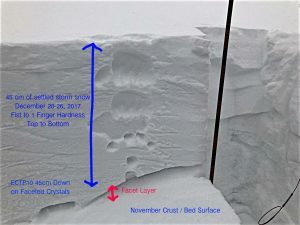 Pits while helpful in understanding trends in the snowpack are often less reliable when using them as a single point of reference. Their reliability and ease of interpretation increases when patterns are repeatable and show definitive instability in the snowpack. The current trend that we are observing is one of spacial consistency, meaning at similar aspects and elevations we are seeing similar results. Specifically we are seeing ECT results that show propagation. Additionally, we are seeing that when the over riding slab is stiffer the failure comes easier. The stiffening is due to natural settlement and wind effect on the over riding slab. As the slab stiffens, it is able to communicate the failure of the weak layer better. Think of a soft slab as a piece of paper. When you initiate a tear in the paper it stops when you quit pulling on it. Although, when you initiate a crack in something like a pencil, the crack quickly propagates through the pencil. This is what happens as a slab stiffens. It is more likely to promote propagation as it becomes stiffer. If you look at the post from December 26th you will notice that the slab is 4-finger in hardness. We observes an ECT score of ECTP15. Today the slab was 1-finger in hardness and the ECT score was ECTP10. 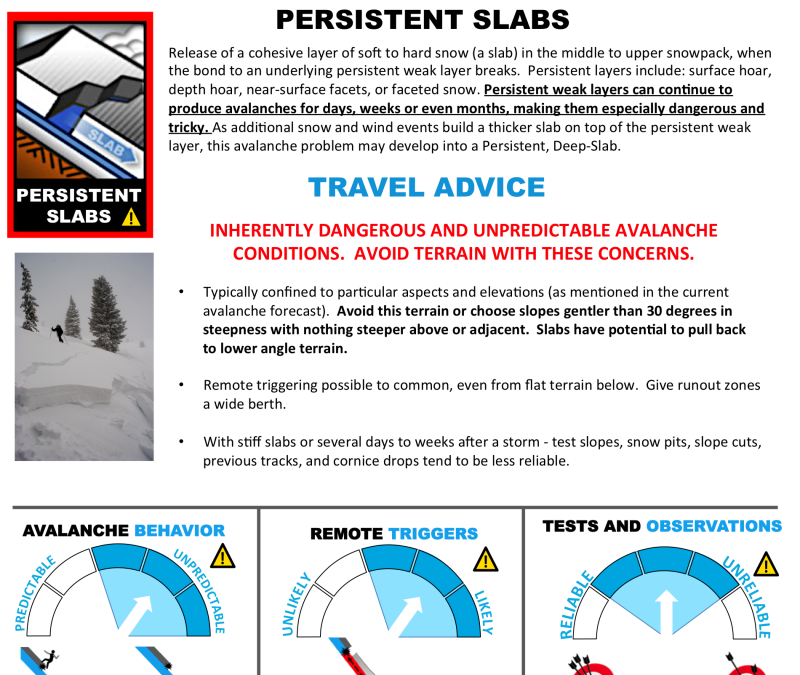 Stiffer slab + easier to communicate failure = less loading steps in tests = more easily to trigger an avalanche. We saw a similar set up early season last year with a facet crust combination. The weak layer became reactive in tests once a slab was over riding it. As the slab stiffened we saw avalanche activity begin. Once we saw additional load the avalanche activity became larger and more destructive. The avalanche activity we are seeing this year on this facet/crust combo is already destructive…it will most likely become even more destructive if we get additional accumulation. At the end of the day decisions should be easy with these types of test results…stay out of avalanche terrain.